I love my tech gadgets, and I’m always excited to try a new computer or tablet. I was doubly excited to try the new HP Envy x2 PC because it is both a laptop and a tablet! This 3.1 lb computer is small and sleek and perfect for taking places, and its portability increases when you detach the screen and it becomes a stand alone tablet. 8 MP rear facing camera, and a front facing camera too! Since I am new to Windows 8, this has been a bit of a learning curve for me. The whole setup is a little daunting at first, but once I figured out the basics I was able to find some pretty handy tools. I love the HP Pagelift for documents. With this app, you can use the tablet to take a picture of a document and the app will flatten it to look like a scan. I created this Valentine’s Calendar using the tablet camera and the HP software that came with the Photosmart printer, and then I snapped a picture of my printed calendar using Pagelift. The end result is the image on the left. I think it worked great and will come in handy for contracts and other documents. My husband is particularly impressed with his ability to control the Xbox using the Envy x2. The Smartglass app opens up your Xbox and you can look at the games you have, watch Netflix (providing you have it on your Xbox like we do), and surf through You Tube videos. HP offers a huge number of apps for the Envy including games, entertainment, productivity, and many more apps. The kids found several games and activities that they love, as you can see below. I really like the flash card game that Kellen is playing in the middle picture. They can have fun and learn at the same time! Overall I am really impressed with the HP Envy x2. The sound and graphics are excellent, the system is so light and portable and there is a lot to offer in terms of apps. There is a headphone jack in the tablet and the keyboard, as well as USB ports in the keyboard. There is no disk drive, but I didn’t find that to be a problem. The memory is just 64 GBs, so if you store a lot of images, etc on your computer like I do, you will need a back up drive for storage. The perfect partner for the Envy is the HP Photosmart 7520 e-All-in-one printer. This machine prints, copies, scans and faxes and it can all be done through a wireless connection. I was not looking forward to setting up the wireless connection on the printer, because that is something that has caused me some headaches with past printers, but I had nothing to dread! It took a matter of minutes for the printer to be on the network. I really like the software that came with the printer. I have been using HP Photo Creations to put together some photo book pages, to make the calendar above and I am going to make some photo collages with it as well. The printer itself prints beautiful pictures. I printed out some of my favourite photos of the kids and the quality is just as good as I would get having them printed in a lab. To celebrate Valentine’s Day, my daughter and I put together some Valentine’s Day crafts that we could make using the HP Envy 2 and the Photosmart 7520. She designed some Valentine’s bookmarks and a really cute Valentine’s card that looks like a real vase holding a lollipop bouquet. I made some custom messages and glued them to the bottom of Hershey’s Kisses, and I printed off some photos that I plan to frame. There are so many Valentine’s crafts we could do, and it’s a great way to spend some time together. One of my lucky readers is going to win an HP Envy x2 PC and an HP Photosmart 7520 e-All-in-one printer! awesome prize, would love to win it! I would print up some custom cards for valentines day and add lollypops to them! I would use this to print off personalized Valentine’s day cards for my little ones’ classmates! Valentine’s card that looks like a real vase holding a lollipop bouquet. I would print off Valentine crafts and valentine-related crosswords for fun! Only I should follow new people or update profile – maybe I miss understand and if so it is not clear. Unfortunately, it doesn’t give any other options for verification and I have to have something in place to verify the entry method was done. personalized valentines for my son’s daycare class, plus ones for Grandma & Grandpa too! I would make my kid’s very first valentines to hand out at daycare! WOW so many to choose from, I really like the kisses one! I could work together with my 5 year old to create Valentines to hand out in class… and then something incorporating photos of the kids for the grandparents. I would print Valentine’s cards and put some chocolate with them! I would work with my five year old daughter to make whatever type of valentine she wanted to give out to her classmates at school. Knowing her it would either be Pink or Star Wars. I’d use it to make greeting cards and baking labels for Valentine’s Day. My kids and I would make home made Valentine’s Day cards for their friends! My daughter loves to colour so I could print out some Valentines colouring pages for her. Valentines of course. My son wants to make Minecraft Valentines. I would like to make the homemade valentines day cards especially the ones with the suckers so cute! Cards! I’d love to do that. We could make our own Valentine’s Day cards or pictures! Picture personalized Valentine’s day cards. My daughter is SO creative…. I would use printer to copy and print her homemade Valentine’s cards for her class, and maybe take a picture with the tablet to add to the cards. Personalized Valentines Cards with my kids pics on them! I’d print off some hearts to attach together for a heart garland – maybe with some photos of my boys on some of the hearts. This printer would have been perfect when I made my husband’s valentine’s day gifts yesterday! I made our wedding scrapbook and a beautiful collage picture of us with his parents! We recently moved and my printer broke in the process – I could REALLY use a new one! I’d help my daughter make personalized Valentines day cards for her classmates instead of the you’ve seen it a 100 times ‘I choo choo choose you’ store crap. I’m sure she’d want to some how incorporate dragons into it and my little pet shops. But it’d be original, that I guarantee. I would make little hearts and leave them around for my husband – in his bathroom drawer, lunch bag, car. I would make huuby a Valentine’s Day card! I could make the valentines day cards, love coupons for my hubby, decorations for the house…. Our pics printed out on a heart shape frame cut out. I could make Valentine’s Cards with my THREE GRANDSONS, to give out to their friends at their schools. I would make a card with suckers. I would print out a template of a heart and use it to cut out pink and red hearts for a mice/lollipop craft that I have in mind. I could make cards with my grandson’s picture on them to send to relatives. With the HP Envy x2 & a Photosmart printer, I could make the photos in the Valentine shapes! You could make them for Valentines but use them each year on your Christmas tree. I love it!! I would love to make a calendar for grandma! I would make the Valentine’s bookmarks, I’m a big reader and try to encourage all my friends to pick up a book more often. I’d love to make Valentine’s Day cards with my boys’ pictures on them. I don’t have a color printer, and I’d love to be able to do this at home. This would be perfect for my 6 year old daughter’s school class Valentines cards. I would make homemade cards. I would also make a little garland with different size hearts. So cute. For some reason the first thing that came to mind was placeholders for valentines dinner. Photocards for my kids classmates of favourite characters. photobooks, bound with red, pink and white ribbons. Could probably print out some pop up cards and maybe some origami. I could PhotoShop some pics of my daughters and make them into bookmarks for my husband. I would make Valentine’s Day cards! Just for any kind or sort of printing that needs to be done. Valentine photocards and honey-lovecards for hubby! I would make photo cards for my family. I would make Valentine cards. Shhhh. My 17month old daughter would help daddy make some cool presents for mommy! I would make valentine cards with my kids for their fiends and I would make a coupon book for my hubby. My kids and I would make Valentines day pictures for all of the grandparents. Well, I’m not big on crafts, maybe a card for my boys. I’d love to make some vday cards! Design and Print out a Heart shape card I could cut out and sprinkle with some loving glitter and give to my honey. I would print out beautiful valentine card for my honey. Also, awsome colouring prints for the little ones. I could make cards for my family. I could make valentine cards. I would make cards for all my friends saying why they are my true valentines. create and print almost anything you wish. I would use the HP Envy x2 PC and an HP Photosmart 7520 e-All-in-one printer! to create special photo Valentine’s cards and then fax them to far away family. I would make picture cards!! I would make valentines cupcake toppers! I would make a banner. What a wonderful prize for the family. I would print photos & attach special Valentine’s Day messages to them. I would make those custom messages for the kisses! What a cool idea! Well there are so many fabulous cards and crafts on http://www.family.go.com. I would be printing for days with this fabulous printer! I would make Valentine’s day cards. I would make fun cards and flower designs! I would love to make birthday cards on this printer. I would design some photo cards on the computer and print them out on the printer. I love the Valentine bookmarks.. think I’ll make some if I win!! I am wanting to make Valentines for the kids that I saw on Pinterest. I’m taking a picture of the kids holding an arm out toward the camera, and then with cut openings on the top and bottom of their hands and insert a lollipop. That sounds like a cool project.You can also do a heart sucker or rose also. I would make valentine cards with photos and special messages for my friends and family. Valentine cards for my nieces and nephews and decorations for the office. I’d love to make that card with the lollipops! So cool! We just made our own lollipop cards but got them printed at Staples… would be nice to have done it all at home! The bookmarks are a great idea. Cute yet practical! This is an amazing set of products that can almost make your Valentine’s projects endless. My daughters and I could make a card for their Mom with pictures and other artwork. Another idea is to do a video greeting card, nothing like saying “I Love You” via video, to be able to watch as your love ones see the amount of effort you put into saying “you are my Valentine” is priceless. The Valentine’s Day Crafts I could make would be cards with photographs on them and flowers and hearts with verses and names. I would also do place cards for meals and whatever crafts I could find on the internet that I find creative and fun for my husband of 22+ years. i want to use it to make homemade valentine cards! I’d like to win the HP Envy X2 PC & Potosmart Printer!! I’d make cards with candy attached. Personalized Valentine’s Day cards! Possibilities are endless! The cards in the store are either too mushy or too crude….I can make my own instead!! I love doing photo collages. Being Valentines every heart gets a friendly face inside. It would be fun to make Valentine cards for everyone I love! I could make some super cute photo valentines! Is this open in the USA? I hope so! I would make a valentine for all my Grandkids! I would like to make a family collage with all our pictures! A customer Valentine Day’s card. I would like to make photo prints of nieces and nephews to put on valentine cards. I would create the most amazing marriage proposal if I won! I’d make some Valentine Cards! I would make some custom cards with family photos. I love the Valentine’s bookmark and would make those! We would make some photo cards to give out for Valentine’s day. Would make valentine;s day invitations. I’d love to make some valentines for my grandkidlets! I really like the Valentine Bookmarks! So cute 😀 The Kisses are pretty awesome too. We could make awesome cards and a banner for Valentine’s day. I would make cards for every occasion and print art and crafts for the kids! I would make some Valentines day cards. I like the idea of making our own bookmarks. I could make great Valentine cards for all the kids in my class. i like the bookmarks , very cute and i would love to try to make them!!! I would love to create valentine’s day cards that have pictures of our family on them. I would love to make a Valentine card for my children. I would make a collage and print it – it would have pictures and sayings to give to my mom. I am a Paint Shop Pro fanatic so I would create a Valentine card for my hubby and print it on photopaper so I could frame it for him. I could make cute little cards with photos. I like the calendar idea you made and also cards would be super easy. I’d love to make the cute cards I’ve seen on pinterest where it looks like the kid is holding out a giant lollipop… they just hold their empty hand out and then you slip a lollipop (real one) into their hands via a couple of slits in the picture. My 11 year old has his first crush and he would use it to make a personalized card for his crush! I would make pretty cards with pictures of my grandchildren on them. I like the idea of calendars too. You could use it to make those cute “love coupons” for V-day! You know, like “Good for one free hug”, “Good for one free dinner out with me”, etc. Certainly I could make a card, but I also could print loads of hearts to distribute around the house. Would love to make a collage and so need a need a new printer and well as a blogger I can see this being more then a little handy! For Valentine’s Day I would use this to create personalized photo books of all those photos that are taken digitally but don’t ever get printed. I would do this yearly as a keepsake and to look back at what we’ve done. I even make one for my parents to show their love through the years! I love printing cool stuff. I have so many digital photos that I need to print and frame. I would make valentine stickers and embellisments for my scrapbooking projects. I would make cards for my kids and my husband and I would help my kids make cards for their dad. Some awesome crafts that could be done with this printer are Valetine’s Day Party invitations and decorations as well as cards. My grandson has a think for Calendars, we would make one for February. He likes to decorate the holidays. I would make my grandchildren Valentine Cards. Like many have mentioned, I would use it to make cards! Valentine’s cards, what the heck all cards. I really do still love to make homemade valentine and special occasion cards ♥ Such fantastic and really endlessly sweet ways I could make them with this really wonderful prize! This would be amazing for so many crafts!! Thank you for holding such a great contest! You can make great, and unique valentines cards. I would use it with my 2 year old son to make valentines day cards for my wife. That would be fun! I’d love to scan old family photos from our archives, edit where needed and insert them in homemade valentines! Well, I am not terribly creative but I think I could make some lovely Valentine cards or cards for any occasion and even some book marks as I am always looking for a bookmark. Thanks for the chance to win such a great prize! I could make cards for all of my family and friends. I would make picture collages to frame and bookmarks to give away. I think I would like to make some photos into a collage card for Granny. I could make custom V-day cards with sayings that I want. Home made cards, of course! I would make greeting cards and use them for scrap booking. you make with an HP Envy x2 & a Photosmart printer? I Would Make Valentine’s Day Photo Cards For Family And Friends. Would make personalized place cards for the valentines dinner at my church. I would make some pretty Valentines Day cards for my kids and close friends. I would make personalized photo cards for all holidays, and cool stickers! I could take a picture and make a great Calendar! I would make a collage of my daughter and my nephew for my dad back home [in Argentina] and of my sister and I when we were kids so he can see what he and our late mother started! Thanks for the opportunity to share fantastic ideas! I could make holiday cards! Gift bags/boxes and treat holders. I would love to create Valentine stickers and cards. Cards, photos, invitatons and I love your bookmark idea! Would love to win this! Excellent product, HP. My daughter needs a system upgrade. This would replace my old HP system and I would continue to use it on the internet to print out interesting information and enter contests. I can See some crazy scrapbooking coming. With the HP Envy x2 & a Photosmart printer, I’d love to design and print Valentine’s Day crafts such as love notes to a wonderful person. Would love to make the Valentine’s bookmarks! I’d print a collage of photos of my girls with pink and red hearts that they could cut out for bookmarks to mail to faraway family without email! We made foam heart-shaped picture frames with the kids’ pictures in them for the grandparents. I would make an album for each of my 5 kids, if I won the HP Envy x2 & a Photosmart printer. And a special Grandma’s brag book for my mother in law who adores her grandkids! I like to use Photoshop to make personalized valentines for my son’s little friends. This would make it way easier to make the valentines when on the go! I would make collage pictures for gifts. I would use it to print valentine cards for my granddaughter (and I would spend a lot of time on line looking for and printing out projects for her to do. scrapbooking, cards, picture frames, the list goes on!!! I would love this prize to print cards for all the events in our family and others. I would use it to print off personal labels for valentines cards. I would make some photo collages and my grandson loves taking pictures and he’s pretty good at it, too! I would love to have him take pics of his favorite things, his horses, his dogs, cats, his little John Deere tractor and his cars toys and print them out, paste them onto colorful paper plates and help him make a colorful mobile for his bedroom! Wow, would this ever be a win, Could I get lucky? I would love to make some personalized cards and decorative boxes. Need this to print my own biz cards and start a biz. I would make personalized cards and print photos to make storybooks for my kids! oh lord . love to win this gift . have never won this big before . thank u .
I could teach and help my grandchildren how to make things. I would make cards – for every occassion – for my friends and family! As a small business owner I am just starting out with my photography business. 🙂 It would be nice to print off some prints for clients at home, instead of constantly having to pay a printer like Black’s. As a teacher the sky what be the limit as to what Valentine crafts I could create. … always wanted to make my own calendar. Now, that would be very nice especially have four grandson’s from the ages of 16 mos. to 10 years of age! My kids would love to design their own valentines cards and print them. There’s no better card than a personal one made on the computer! I’d make personalized placecards and placemats for family dinners on Valentine’s Day and for every special event. I’m still one of the few people in my family that still likes to give special occasion cards. I would love to use the HP ENVY computer & HP Photosmart 7520 printer to make my own creations. Let the imagination begin! I’d make original pop-up heart cards with confetti. Lots of printables, and cards! I would make personal cards with photos of great moments together. I would make valentine cards and magnets. I would make cards and magnets. So many things I could do with this – fingers crossed! Personalized cards seems like fun! My girls and I would definitely have made Valentine’s Day cards. I would make 3D cards with family photos. I love the calendar and would make my own as a Valentine’s gift with this great prize. I would make some fantastic Valentine’s Day cards! I could make some great cards with that, also some nice colouring pages for my daughter. I would make the calendar and send it to friends and family. I would print out pics of my preschool kids at the day care to make personalized cards for mom and day for Mother’s/Father’s Day. Making birthday cards is very personal and unique. I could make valentine’s cards which I almost had to do. I ran out of time but thankfully a friend of mine was at the store as they were closing and picked me up some. My daughter loves to create her own pages to color. I could make some invitations to a Valentine Party or print up some little notes to put in lunches on Valentines Day with cute graphics and nice lettering on them. A custom photo book with my wife and I.
I would make Valentine cards with family photos on them. The bookmark idea is great. We are a family of readers. I would make a bunch with everyone’s picture so they would all know whose was whose. I would love to print some quirky photo cards (maybe of heart shapes found in nature?! ), I would use it for all occasions! 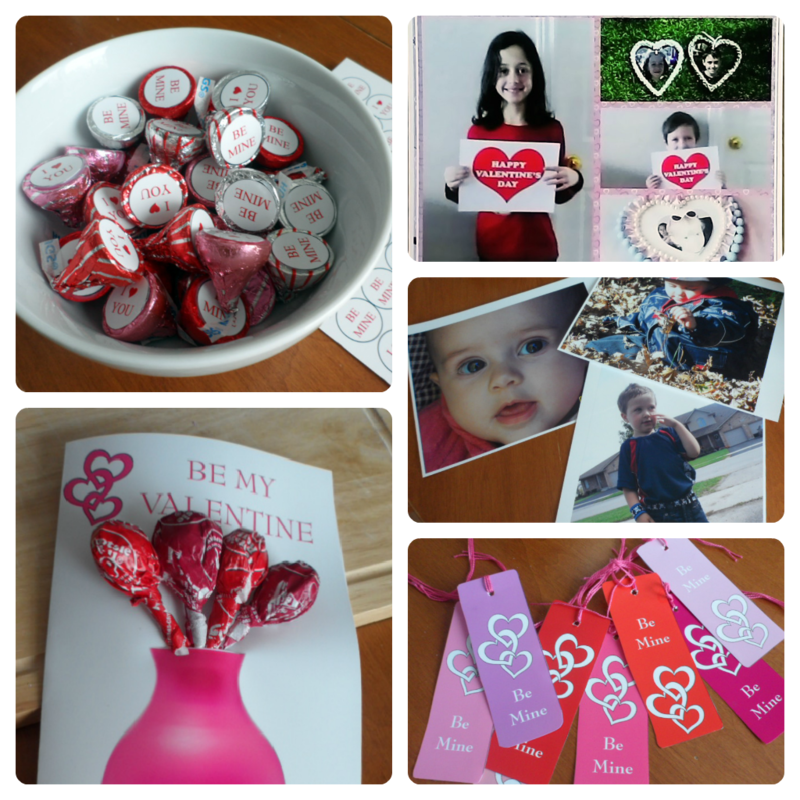 A custom photo book, or some fun little cards/valentines with my little ones! I’d like to win an HP Envy X2 Computer & Photosmart Printer!! I would help the kids make personalized photo valentine cards. I would make a personal card!! I would make cards for my grandchildren with this! I would make cards for my nieces and nephews! Cards would be great to make. I’d make some Special Sight Hound cards, perfect for my kids. I would make Star Wars valentines if I won this. I love to make cards, that would be one of the first things I would try to do…or maybe a family calendar? I would use this printer to make Valentines hearts for next year. I would write out some of our most memorable moments in each heart and place them around the house. I would make valentines and christmas ecards for the family! I would make a card with a picture of my husband and I.
I’d make so many different things from personalized photo cards to many printable Martha Stewart templates I found for baked goods, favors and customizable organizational labels. I would make the cards and bookmarks. I would make cards for daughter. I’ve never had a laptop and would love to have one, HP has always been my preferance and this would be great to take when I visit my grandchildren. I love teaching them new things. I would print out a picture collage of all of my family and put it as a keep sake in my daughter’s baby book. I’d probably make a pop-up card or two. I could make a Valentine’s card, love the one you guys made with the vase holding the lollipops, so cute! Right now I have a Kodak printer that does not hold the color and everything prints red on my photos. i would love to get a new printer and kick this Kodak to the curb. Oh an dBTW, it is my 2nd Kodak printer as the 1st one was replaced under warrenty. The combination of creativity and technology guarantees nothing is beyond the scope. I would suggest having some good quality coloured paper, as it not only allows for a background that reaches the edges, but allows you to focus the HP printing on your work, not your paper. I would love to make cute valentines lunchbox notes — not only for valentines, but for weekly lunch surprises. I would like to make Valentines window decorations. The HP Envy X2 PC offers life to those who are always on the go. Especially for the parents who always find themselves scrambling the night before Valentine’s to get cards organize for your childs classmates. Once we learnt the ins and out of the user friendly software this PC would allow our family to make Valentine’s cards from our own living room at ease while lounging on our sofa. The portability of this product would make this possible being cordless and light weighted to carry all over the house. The bonus part of this giveaway is the Photosmart Printer that is included. This printer would be beneficial to print the valentine cards in great clarity, giving them a professional look. The best part of these products is it can be done all from your house without any hassle. We could also use these products to make Valentine decorations to put around your house for the festival day. Furthermore we could take advantage of the portability of this PC and bring it into our kitchen where we could look up valentine recipes to make cookies and cup cakes. This would be a great way to take advantage of family bonding time and if the recipes are a success we could simply print them out and save them for next year. A HP Envy X2 PC and Photosmart Printer would go along way in our house! Making valentine cards is very easy! I could make an awesome scrapbook of loving memories. I would make some awesome valentine cards for my family with a family picture on them. I would make awesome valentine cards for my grandson to give out to his friends with his picture on them. Could make valentine cards with HP printer and lots of red hearts to decorate windows. I would make thank you cards for my children’s teachers. I would love those kisses with words on them – much better treat than the conversation hearts! I would probably also do Valentines Day lunch messages too….so I could stick them to their snacks and sandwiches without them seeing it before my girls open them up at school (you can do the same thing with your spouse or partner!). I love the hershey’s kisses with the messages on the chocolates. I would totally make them! i would make cards for my loved one to brighten up their days. It would be fun to make cards or decorations! I could print little heart picture frames & put my kid’s pictures in them to give to their grandparents. I would use it to make customized cards. i would make cards, I am a romantic when it comes to valentine;s cards! Not only would the printer be good for scrap-booking, cards but its photo’s would beat my old printer by a mile! I could make personalized cards! I would print out a template for a selection of mini hearts on pink, purple and red paper. I would make my own cards to give to my family. I have been entering this contest from the beginning but now my entries are not showing on the form. I would make signs for our stall at the Farmer’s Market. …and for Valentine’s I would print photos of the baby to send to all of his grandmothers. Would make cards with my granddaughter. I would make a scrapbook for my boyfriend! Who wouldn’t want to win that wonderful prize? I would make Valentine’s cards for my kids to hand out. This seems like such a great computer and printer to have, and so versatile. You could make your own printable Valentine’s day cards and banners. I ♥ making homemade Valentine’s greeting card, and especially using vintage or old skool/retro styles! A new printer would make my crafts sweeter, it would be so fantastic to have one. I could make personalized Invitations. I would make special personalized cards for my family. I would do collage pictures for frames. Little trains I could make with an HP Envy x2 & a Photosmart printer..
A collage of pictures for family and friends! IT WOULD BE WONDERFUL TO HAVE THIS TO ENTERTAIN CHILDREN ON SUMMER HOLIDAYS ON THOSE LONG CAR DRIVES AND AT HOTELS WHEN YOU GET THERE! Using the HP Envy 2x and Photosmart Printer, we could make Valentine’s Day cards. I could make personalized scrapbook flowers with pictures in them. I love scrapbooking! I would make collages of my life to share with my family! I would use the HP Envy and Photosmart Printer to make Valentine’s Day cards. Great system my entire family can use and enjoy. a card for my hubby !!! My daughter would put the printer to good use printing a bunch of stories. I love the little tags you made for the kisses – I would love to do this! We could make personalized cards with our own pictures and make them awesome! I could start scrapbooking again, especially now that I’m a Nanny! Homemade Valentine’s cards and bookmarks with romantic or poetic quotes would be awesome projects! Since moving from Quebec to Nova Scotia 3 years ago, I haven’t had the chance to see my family back home very often, and my parents haven’t yet had the chance to meet their newest grandson. So I would take family photos and print them out to send to my family back in Quebec, so they could have some mementos to tide them over until we can go visit them. Cards with pictures of family members. My kids could make their own v day cards. I would make cards and banners with this. You could make some great personalized cards using pictures of yourself with your loved ones. I love homemade gifts and think I could make some wonderful printed and professional looking items all year. I really love the bouquet of lollipops in the vase. I think it’s adorable. I would make Valentine’s for each of the kids in my daughter’s preschool class. I would make great personalized Valentine’s Day photo cards for my kids. photo cards from the kids ! I would make heart shaped decorations for the house… and photo cards for my family!! To win an HP Envy Computer & Photosmart Printer would be great! !